If you are planning to get a mediclaim policy, remember these things before opting for a mediclaim in India as health insurance is among the most important insurances in one’s life and you shouldn’t go wrong with it. Disclose any pre-existing disease you may have at the time of taking the policy or else this will result in your claim not being approved when you need it. Any disease that you have at the time of taking the health insurance India policy is termed as pre-existing disease. This can be anything, diabetes, asthma you had since childhood etc. Pre-existing disease will be covered only after 3-5 years of continuous policy renewals and only if it was declared by you at the time of taking the policy. There are also policies that will specifically cover some pre-existing diseases from the first year itself, you can ask about them to you advisor. Remember before taking a mediclaim policy India, that it is a yearly thing. Your policy gets reviewed and renewed every year. However it is considered in effect from the first year you paid the premium for, but will have to be renewed every year and at that time, your claims, if any in the previous policy year will be checked and the premium may go up in case you had a claim in that year. This however depends on the amount of claim made; sometimes the premium may not go up with a nominal first time claim. Some health insurance in India comes with a two year premium payment option too, but not more than that. You will have to get your mediclaim policy renewed and reviewed every year. However, almost all policies have a minimum waiting period before you can make a claim. Do not skip from company to company and plan to plan, as each time you will have to go through the minimum waiting period before which you can make a claim. So opt for one plan and company carefully and stick to it. If you have to change, change it within the first 2 years. Also Read: Why is 'Will' important to have a 'Way'? As your age increases, you will be liable to pay higher premium for the same mediclaim policy. This is called ‘loading’. For instance the amount of premium you will pay when you will be in the age group of 35-40 will be higher compared to the premium you paid when you were in the 25-30 age group. This is something to remember before getting a health insurance in India. Unlike a life insurance policy where you pay a fixed premium amount throughout the term, mediclaim will require you to pay higher premiums with increasing age. The reimbursement under a mediclaim policy will be made only in case of hospitalization and that too, for a time frame of at least 24 hours. Day-care procedures or in other words any hospitalization that is required for less than 24 hours will not be covered under your mediclaim. This often results in confusion among the mediclaim buyers, because a lot of us neglect to go through or understand the clauses. However, some policies provide exception to this case and certain procedures may be covered even when the hospitalization is for less than 24 hours. This is something you will have to remember before getting your mediclaim policy in India. Also Read: Multiple Health Insurance Policies: How it works? Mediclaim is not a life-long affair and once you cross a certain age, the mediclaim will stop to exist for you. The existing policy that you took when you were in your 20’s or 30’s, will no longer work when you will cross 65 or 70. Some mediclaim do provide an upper limit of 75 years but that is it. Beyond that, you will have to opt for a separate senior citizen medical insurance plan. So keep this in mind when taking a mediclaim policy, and opt for the one that provides a higher age limit if not the highest. Once you zero-in on a good mediclaim policy, the fine print you must read and understand is that even though there is a sum assured that you can claim in a year, there are various limits that come with the sum assured limit. These could be the limit on expenses allowed per-day in terms of doctor’s fee, medicines, and room-rent for a day, etc. These are sub-limits. For instance if you undergo a surgical procedure that will cost you Rs. 1,50,000 and hospitalization of 3 days and your mediclaim is for Rs. 3,00,000 then you shouldn’t be smiling that your entire cost will be reimbursed. This is because there will be these sub-limits. In the above scenario, if you opted for a room which had a rent of Rs. 6,000 per day- for 3 days you paid Rs. 18,000. Now if your sub-limit for room rent is around Rs. 3,000 per day you are likely to get only Rs. 9,000 and not the entire 18,000. Also these sub-limits apply in case of doctor’s fees, daily medical allowances etc. So when you take a health insurance plan, make sure you are aware of this. This is another area that a lot of us overlook. A lot of mediclaim insurance providers avoid covering maternity expenses. Even if they do, it is usually with a time limit after which it will be covered and is usually 3 years from the time of paying your first premium. Also maternity in itself as well as any expense related before or after the birth of your child, which may result in hospitalization of the covered mother, will not be covered as it is related to maternity clause. Very few insurance providers cover maternity expenses right from the word go. So keep this in mind. Also Read: Buying Insurance by just comparing premiums? You may be in for trouble. Lastly, please make sure to go through the list of ‘Exceptions’ or ‘List of Disease or Medical procedures not Covered’ by your mediclaim insurance India. Usually cataract, dental procedures, cosmetic procedures etc. will not be covered. Also any hospitalization resulting from diseases that are in the ‘Not Covered’ section of your policy will not be reimbursed. You can opt for a separate critical illness cover for that. Also there will be certain cases and scenarios, under which medical expenses may not be reimbursed, be aware of that. 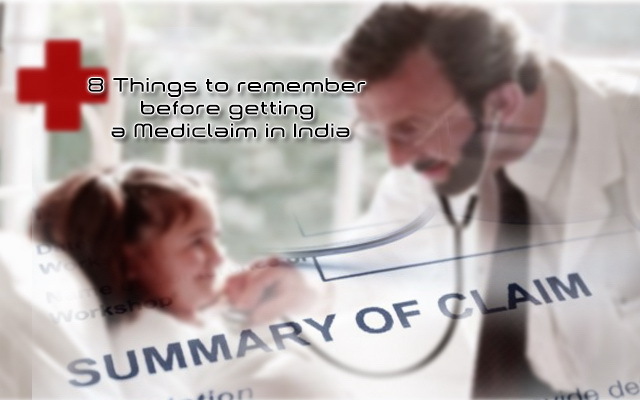 These are some of the important things to remember before getting a mediclaim policy in India. It is always advisable to understand something you are buying at the same time keep one thing in mind, that while insurance is important for you and your family in any form, it is ultimately a business for the companies providing insurance to you. There will be clauses, conditions and exceptions when your claim will not be approved, and you better be aware of them before paying the first premium. Go through the terms and conditions, as this one time effort will save you the agony and disappointment later. If you follow these points and are fully aware and disclose all illnesses and diseases your claim settlement will be smooth. Thank u so much as I’m enriched very much by the valuable informations….